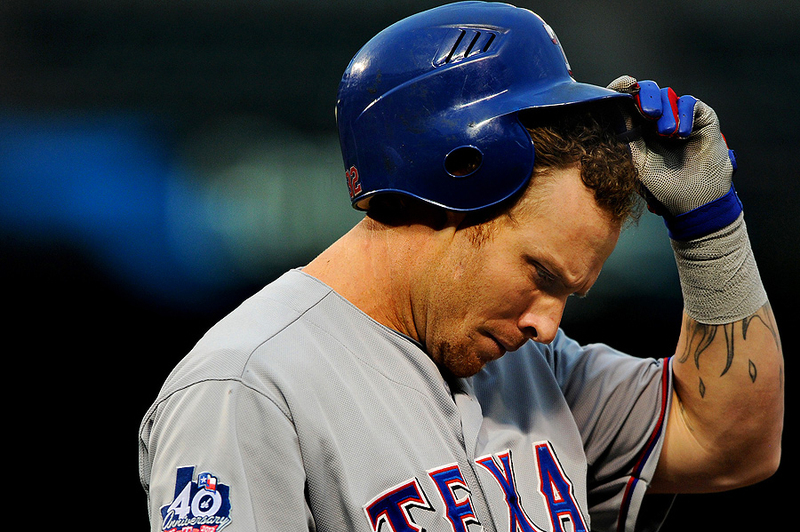 "Texas Rangers batter Josh Hamilton #32 is met in the dugout by teammates after hitting his fourth two-run home run in the eighth inning against the Baltimore Orioles during their MLB American League baseball game at Oriole Park at Camden Yards in Baltimore, Maryland, May 8, 2012. 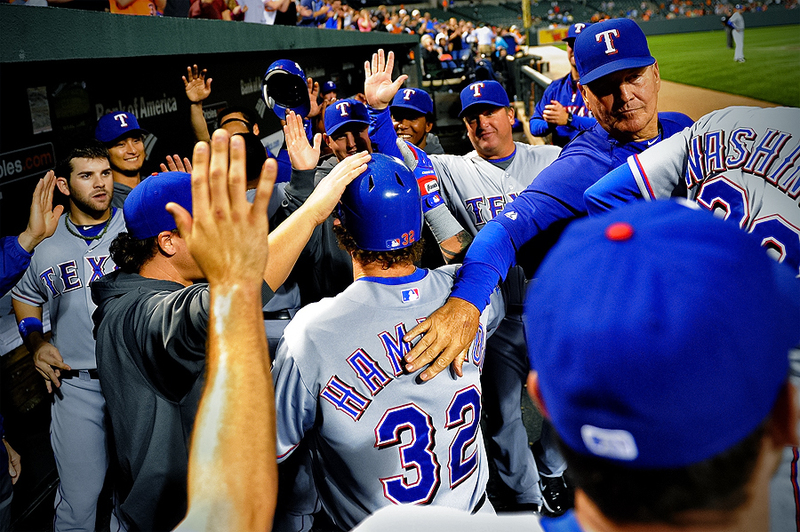 Hamilton belted four home runs and added a double in the Rangers, 10-3, win." It was just another game. Another rainy night. Possibly another runaway game for the Texas Rangers. An early two-run home run by Texas Rangers slugger Josh Hamilton put a smile on photographers faces as easy pictures were made. But then he blasted a two-run homer again, again, and again. The night went from ordinary to extraordinary. After Hamilton's second home run, I had a feeling something was happening, so I positioned myself on the concourse to get a better angle for his probable third. Then he crushed his third. And then, I knew if he cranked another, a frame needed to be made with the wide angle in the dugout. So I camped inside third photo well and waited for history to be made. Goodbye, number four. Like Hamilton or not, that's good baseball. That was a tremendous performance. Baseball fans should applaud the effort as they did at Oriole Park at Camden Yards. The ironic thing was that I was going to blog before this happened about shooting pictures early that tell a story early in the game, but then are never seen. Thus being this image which was never moved Monday night due to a Rangers huge win. Now it's back to "The Yard" to see if Hamilton can crush five home runs tonight. That is, if it ever stops raining.